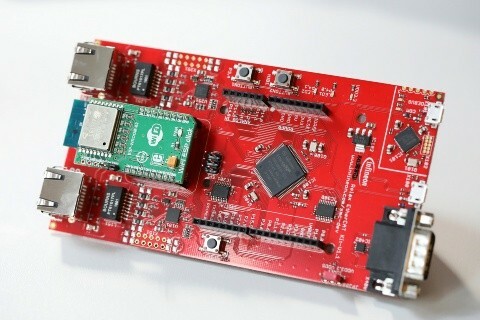 This connectivity board will allow you to connect the cloud services from AWS using the Amazon FreeRTOS software. This kit contains the MCU base board and the WiFi connectivity module, bringing to you the complete out-of-the-box experience. the base kit is a XMC4800 Relax kit with Arduino and Click Board (Mikrolectronica) compatible form factor. The XMC4800 series, Infineon can offer the AWS FreeRTOS solution combined with ETHERCAT functionality in the same device. These XMC4800 devices are powered by Cortex ARM M4F microcontrollers. They also offer up to six standard CAN and ETHERCAT connectivity, for IoT gateway applications, plus many other peripherals.